And awakened remains lovingly present within me. The Moon is at its greatest distance from Earth during this orbit. Its distance will be 251,552 miles. Compare this value to the average distance of 238,857 miles. Ever present questing soulful mind. Tate, London, Turner Bequest, 1856.e, London, Turner Bequest, 1856. Turner here presents the departure of Marcus Attilius Regulus, the Roman general. Regulus was made Consul for the second time about 256 B.C., and with his colleague, Manlius Vulso, commanded in the first war against Carthage. He was made prisoner, and then sent to Rome by the Carthaginians, with an embassy, to make peace. He bound himself by an oath to return if the terms were rejected. Not believing it noble to advise the abandonment of the war, he, regardless of the entreaties of his family, and even of those of the senate and the people, urged its prosecution. This was eventually decided upon. Regulus returned to Carthage and certain death. 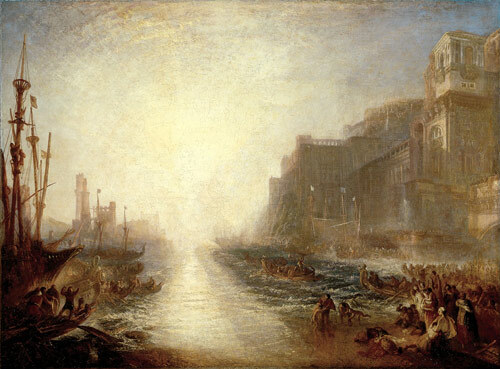 As one who refused to purchase life by sacrificing his country or breaking his oath, Turner bestowed a commemoration upon Regulus in this painting. And so the light, ever present questing soulful mind..
"Throughout history mankind has celebrated the bountiful harvest with thanksgiving ceremonies. Before the establishment of formal religions many ancient farmers believed that their crops contained spirits which caused the crops to grow and die. Many believed that these spirits would be released when the crops were harvested and they had to be destroyed or they would take revenge on the farmers who harvested them. Some of the harvest festivals celebrated the defeat of these spirits. 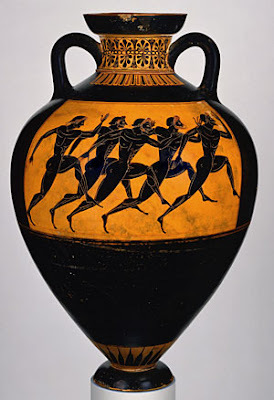 The ancient Greeks worshiped many gods and goddesses. 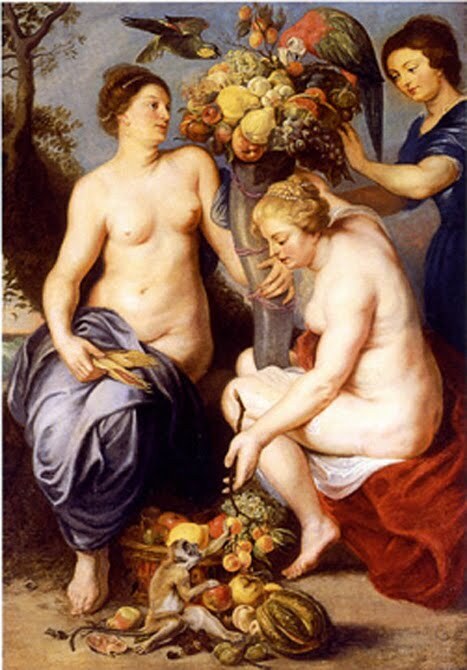 Their goddess of grains was Demeter who was honored at the festival of Thesmosphoria held each autumn. On the first day of the festival married women (possibility connecting childbearing and the raising of crops) would build leafy shelters and furnish them with couches made with plants. On the second day they fasted. On the third day a feast was held and offerings to the goddess Demeter were made - gifts of seed corn, cakes, fruit, and pigs. 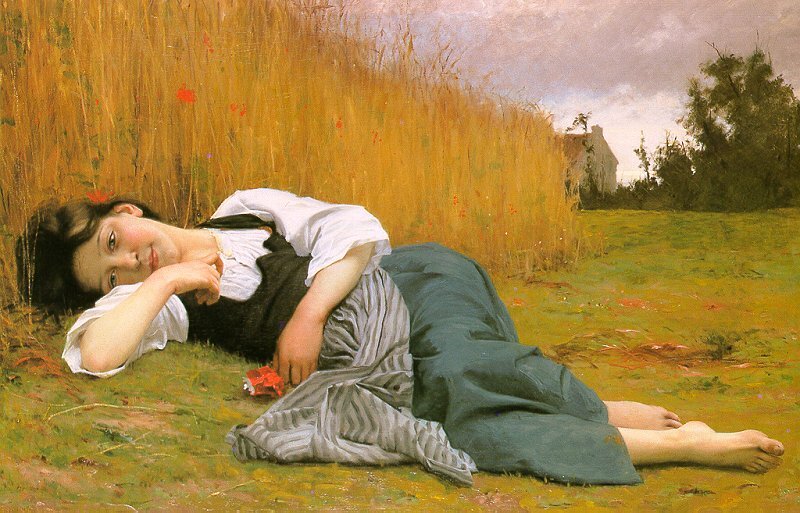 It was hoped that Demeter's gratitude would grant them a good harvest. 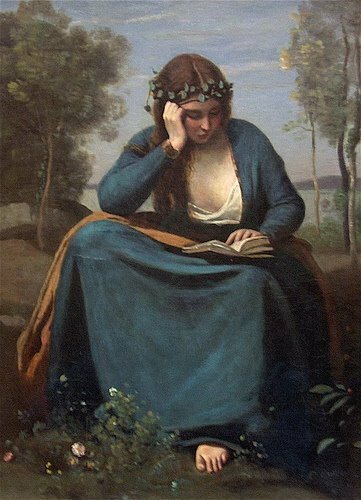 The Romans also celebrated a harvest festival called Cerelia, which honored Ceres their goddess of grains (from which the word cereal comes). The festival was held each year on October 4th and offerings of the first fruits of the harvest and pigs were offered to Ceres. Their celebration included music, parades, games and sports and a thanksgiving feast. The ancient Chinese celebrated their harvest festival, Chung Ch'ui, with the full moon that fell on the 15th day of the 8th month. This day was considered the birthday of the moon and special "moon cakes", round and yellow like the moon, would be baked. Each cake was stamped with the picture of a rabbit - as it was a rabbit, not a man, which the Chinese saw on the face of the moon. The families ate a thanksgiving meal and feasted on roasted pig, harvested fruits and the "moon cakes". It was believed that during the 3 day festival flowers would fall from the moon and those who saw them would be rewarded with good fortune. According to legend Chung Ch'ui also gave thanks for another special occasion. China had been conquered by enemy armies who took control of the Chinese homes and food. The Chinese found themselves homeless and with no food. Many staved. In order to free themselves they decided to attack the invaders. The women baked special moon cakes which were distributed to every family. In each cake was a secret message which contained the time for the attack. When the time came the invaders were surprised and easily defeated. Every year moon cakes are eaten in memory of this victory. Jewish families also celebrate a harvest festival called Sukkoth. Taking place each autumn, Sukkoth has been celebrated for over 3000 years. Sukkoth is know by 2 names - Hag ha Succot - the Feast of the Tabernacles and Hag ha Asif - the Feast of In Gathering. Sukkoth begins on the 15th day of the Hebrew month of Tishri, 5 days after Yom Kippur the most solemn day of the Jewish year. Sukkoth is named for the huts (succots) that Moses and the Israelites lived in as they wandered the desert for 40 years before they reached the Promised Land. These huts were made of branches and were easy to assemble, take apart, and carry as the Israelites wandered through the desert. When celebrating Sukkoth, which lasts for 8 days, the Jewish people build small huts of branches which recall the tabernacles of their ancestors. These huts are constructed as temporary shelters, as the branches are not driven into the ground and the roof is covered with foliage which is spaced to let the light in. Inside the huts are hung fruits and vegetables, including apples, grapes, corn, and pomegranates. On the first 2 nights of Sukkoth the families eat their meals in the huts under the evening sky. The ancient Egyptians celebrated their harvest festival in honor of Min, their god of vegetation and fertility. The festival was held in the springtime, the Egyptian's harvest season. The festival of Min featured a parade in which the Pharaoh took part. After the parade a great feast was held. Music, dancing, and sports were also part of the celebration. When the Egyptian farmers harvested their corn, they wept and pretended to be grief-stricken. This was to deceive the spirit which they believed lived in the corn. They feared the spirit would become angry when the farmers cut down the corn where it lived. In 1621, after a hard and devastating first year in the New World the Pilgrim's fall harvest was very successful and plentiful. There was corn, fruits, vegetables, along with fish which was packed in salt, and meat that was smoke cured over fires. They found they had enough food to put away for the winter. The custom of an annually celebrated thanksgiving, held after the harvest, continued through the years. During the American Revolution (late 1770's) a day of national thanksgiving was suggested by the Continental Congress. Thanksgiving in Canada is celebrated on the second Monday in October. 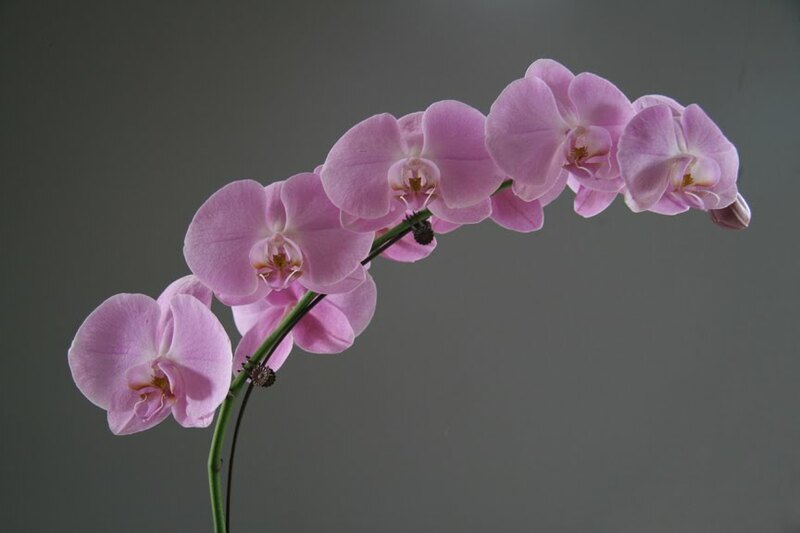 Observance of the day began in 1879." Nymphs Filling The Horn of Plenty, oil on canvas, circa 1617, Sir Peter Paul Rubens, 1577-1640. It is a thanks giving that we each share in many special ways. Thoughts, words, visions, artistry, perspectives, experiences, love and care, are put to print, sent over cyberspace and there we are in the embrace of another, in another space of time. We thank one another and offer responses. We are validated, appreciated and valued for who we are and what we choose to bring to one another. And so my blog friends you are each in Thanksgiving Celebration, your shared abundance honored with joy. Pagoda, Photo, CAR, Collectible Clicks,©Rose Marie Racciopi, 2009. A new journey and one step more. The music of the night songbird. 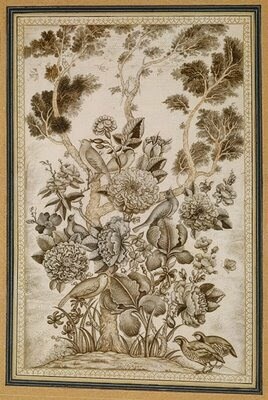 "Rose and nightingale (gul-o-bul-bul) drawing [Iran] (1993.98)". In Heilbrunn Timeline of Art History. New York: The Metropolitan Museum of Art, 2000–. http://www.metmuseum.org/toah/ho/10/wai/ho_1993.98.htm (October 2006)"
One with God, One with goal. 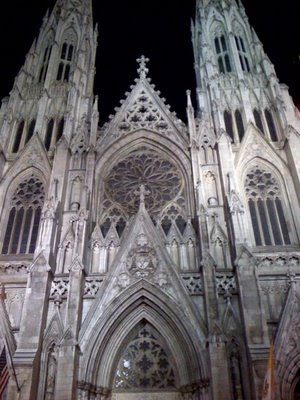 Saint Patrick's Cathedral, NYC, New York, Photograph, PFR, Collectible Clicks©Rose Marie Raccioppi, 2009.
speaks glory to God and to the gifts man can devote to beauty and faith. 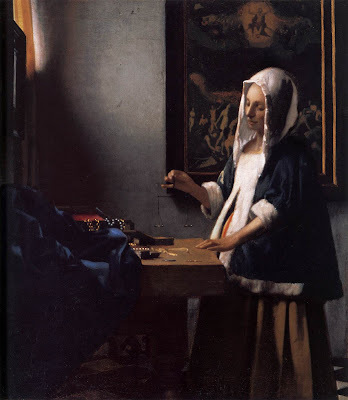 Vermeer has a way of bringing concept, metaphor, beauty and light to all his considerations that become ours to know. There is such depth of spirit and intention in his artistry. This particular work reminding us of the "balance" called for between the material and spiritual values, to reflect on what we chose to "weigh." And so my poetic response, "Appraise Well." The glory of God's gifts eternal sublime. 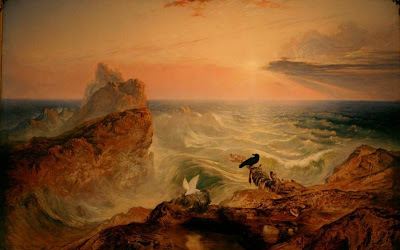 Assuaging of the Waters, 1840, Oil on canvas, John Martin, British, 1789 - 1854. 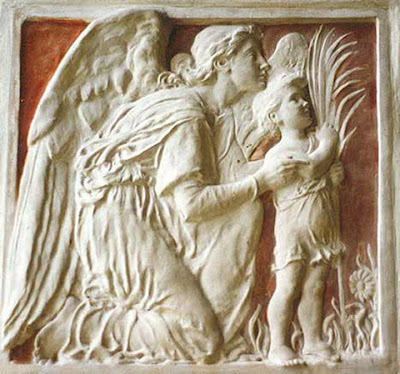 Angel and Child, Relief Sculpture, Ellen Mary Rope, 1855-1934. For those who may be interested in my work with all learners across the age span, I have provided a link at the close of the posted poem. The second posted link, is to a "Commentary" that you may find of particular interest. Our children deserve all the understanding and support we can provide. Yes, we adults are to be guided as well. As a student of life, each child brought before me is another opportunity to learn, to guide and to be guided. To educate is to bring forward. 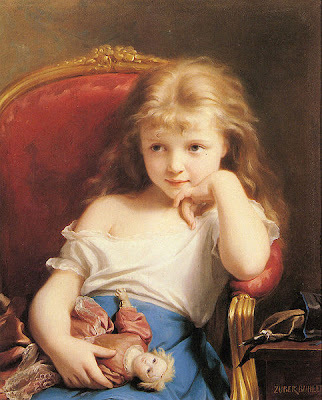 May a shared vision bring us to the APOGEE of our potential, our understanding and our knowing support of all children. Click on title, place title or my name in search bar of Publish America Entry Page.